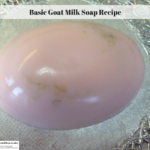 Here is a basic goat milk soap recipe. 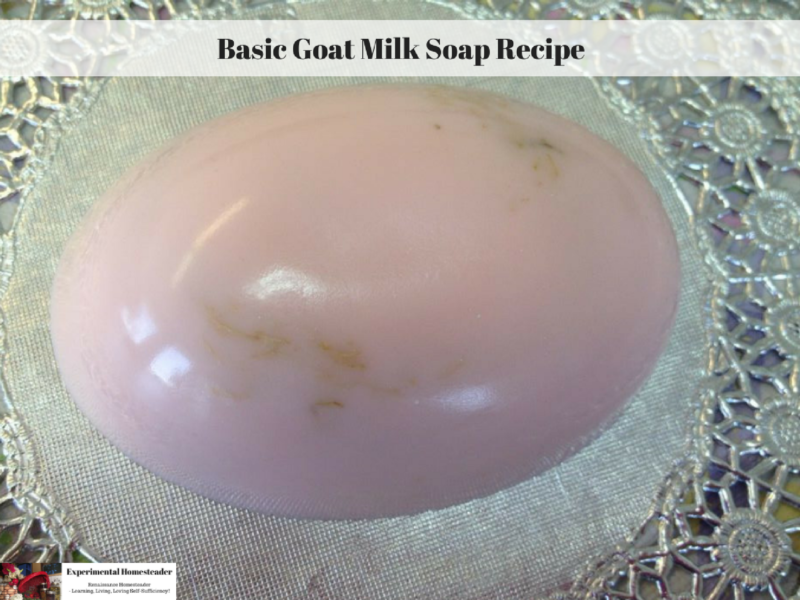 This is my favorite go-to from scratch goat milk soap recipe. There are a few basic supplies you need before you begin to make homemade soap. 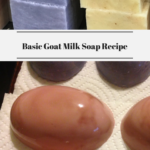 For additional soap making tips and precautions or for a variation on this recipe, be sure to check out this Goat Milk Bar Soap Recipe. Begin by heating the coconut, palm, castor and olive oils to 110 degrees Fahrenheit. Set them aside once they are melted and let them cool. The final temperature should be 85 degrees. Put the goat milk and water into a large stainless steel pan placed in your sink then stir the lye in. Do not put the lye in first. Use a rubber spatula to stir the lye until it dissolves. The lye mixture will heat up. The average temperature is around 180 degrees Fahrenheit. Once the lye dissolves, set the pan it is in a sink of ice cold water. You want to temperature of the lye to cool down to 80 degrees Fahrenheit. Once the oils are cooled to 85 degree Fahrenheit and the lye mixture is cooled to 80 degrees Fahrenheit, slowly pour the lye into the melted oils. Stir the mixture by hand for about ten minutes, mixing to trace using a stick hand blender. Trace is the point when the mixture is clearly thicker than what it was and you can see the the blender forming ridges and dips in the mixture. The ideal consistently is that of pudding that is ready to chill. Add the lavender essential oil. Pour the mixture into the lined soap mold and cover. The ideal soap mold needs to be at least 3 inches deep, otherwise the soap might cool too quickly and seperate. Let the soap sit until it cools. This takes 24 to 48 hours. Do not cover the soap. The soap will be ready for cutting into bars after 24 to 48 hours. Cut the soap into bars and lay it in such a way that air can circulate on all sides of the soap. I use cooling racks for this. I use freezer paper on the rack itself so it does not make indentations on the bars of soap. Cure the soap bars for about a month. I often let mine cure for 6 weeks or longer. The longer they cure the harder the soap is. Once the soap is fully cured, go ahead and package it. I often wrap mine in cling wrap then use a paper sleeve for my label. This makes about 6 pounds of goat milk soap. Note: Be sure to choose lye for soap making as some lye that is used as drain cleaner contains tiny bits of metal flakes. Safety first: Always wear gloves, goggles, a hair net and use rubber gloves. Tip: I recommend weighing all of the ingredients before you begin. This makes the process easier. Tip: Line the soap mold with plastic cling wrap or plastic coated freezer paper. Personally I prefer using the cling wrap. Be sure to overlap the edges of the mold by 2 inches on all sides. Making your own soap is fun and easy, however it is important to use caution. Do not get in a hurry when mixing the lye into the oils. Always double check the temperature of the lye and the oils. It is far better to be safe than sorry when making any type of soap recipe from scratch. It is ok to use any essential oil you prefer, just be sure to use the amount recommended above. Once you get familiar with the soap making process, I feel assured this is a recipe you will want to make again and again. If you’re looking for other types of soap to make, check out this post on how to Make Your Own Coconut Oil Soap At Home from Piwakawaka Valley.